Tired of having to hunt around the site, usually in vain, trying to find one of our "Feature" race coverage pages? Well, despair no more, as you've come to the right place this time. We'll be gradually expanding the listings here as we re-organize (for the umpteenth time) the entire website and dredge up some of those long lost or almost forgotten gems from the past. The features will be listed in chronological order, from the newest to the oldest, with a short description of the "what, when and where" for each one. We hope you enjoy this addition to Northern Thunder. Click on the pictures/logos to access the pages. We've removed some of the older features until they're redone to fit the new format. Kicking off the third season of the UNITED NITRO FUNNY CAR association, the Tucson Dragway Reunion saw eleven nitro nasties dueling in the desert. The supporting cast of blown fuel and alky funny cars, outlaw fuel altereds, and a mix of sportsman cars provided a very entertaining weekend for the Arizona fans. It's back.... another edition of vacation stories and pictures, but this time with a bit of a twist. It's three years later, the trip is two months this time and there's six races packed into eight weekends - with two weeks off to visit relatively relatives in Ontario and take a first bite out of the Big Apple. Other than that, it's more of the same, with fewer in-car pictures as I've promised someone that I wouldn't do that anymore. Join us as we criss-cross the United States and eventually find our way home some 20,000 km later. Oh god no.... Vacation pictures? Run for the exits; log off; hit the back button.... anything but inflict Bob's travel snapshots on your retinal nerves and nervous system. Okay, if you must; if you really insist, I'll let you look at them... just this once.... unless you come back for more, and frankly you've got to keep doing that until you see how the entire story turns out. Five weeks (minimum) on the road; four drag races, a sidetrip up the California central coast; another sidetrip through Death Valley; yet another one to Baja California (again); and finally: a very long drive all the way up the coast from Malibu to Longview, WA and home. Daily, or almost daily updates will make this a "go-to" travel blog. Let's get started. The final race of the season for nostalgia crowd, the end of the line, the holy grail... whatever you want to call it: it's the biggest event of the season for these racers, second only to the March Meet in car count, but first in the hearts of so many racers and fans of this era. If you want to see - and more importantly - hear and feel nearly 40 nitro-burning, ground-pounding, ear-splitting NITRO funny cars running the "can, lid and label" then Auto Club Famoso Raceway is the place to be. We were there to capture as much of the action as we could from the Funny Cars, Top Fuel Dragsters, A/Fuel, Jr. Fuel, 7.0 Pro and the other eight categories in competition. If it's wild, weird and wonderful, it's running at Bakersfield. A very low-key lead-in to the season-ending 20th annual Hot Rod Reunion, this event was originally scheduled to be run earlier in the year at Fontana Raceway. Politics, cranky neighbours and onerous noise restrictions put paid to that idea, so Famoso Raceway stepped up and took on the race. While it was pretty much a secret to race fans, the racers showed up in substantial numbers (over 230 cars in total) and staged just a week before the Reunion, a strong contingent of nitro funny cars and a fuel dragster came out to test and tune. Great, almost too great, weather and sunny skies combined to produce a good, but largely ignored show. However, we were there and we've got the photographic proof. The 11th annual induction ceremony for pioneers and supporters of motorsport in the Lower Mainland of British Columbia is a fitting way to end the local motorsport season. Over the years 180 racers, hot rodders, builders, customizers and others associated with motorsport have been brought into the society. This year's event held a special personal significance as my drag racing mentor and friend, the late Bill Phillips, was finally recognized for the incredible competitive spirit, innovation and dedication that he brought to the sport of drag racing in the 30-something he was involved with it. It was a great afternoon spent bench racing and catching up with many racers, past and present, and getting a chance to see just who has shaped and brought motorsport forward in this area. A real bonus was the virtual car show in the parking lot. 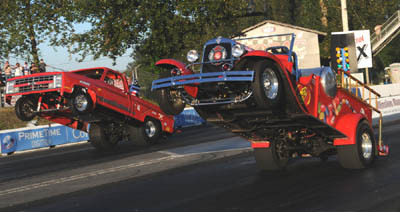 The last major event of the drag racing season at Mission Raceway, the annual "Smoke, Fire & Thunder" show features a grab-bag of cars, led by the Jets - both Funny Car and Dragster configurations, the very popular Northwest BB/Funny Car Association, and the Canada West Doorslammer Association. Throw in a couple of wheelstanders and a group of crazy motorcycle stunt riders for good measure, season it with the regular Pro. Super Pro, Combo eliminators and the newly formed Bad Dog Shootout group, featuring Outlaw 10.5 and Pro Street cars, and you've got the makings of a great way to end the feature season at Mission. It's the 24th annual edition of this venerable event, superseding the original FallNationals and the one-off Autumn Nationals, but the racers and fans still flock to the forests south of Seattle for this annual homage to the nitro gods. The track itself still hasn't progressed very far from its origins some 50 years ago, but one of these days we'll see what the Fiorito family has in store for what should be the finest facility in the Pacific Northwest. In the interim, let's just dig the sounds and smells of serious horsepower reverberating through the trees and shaking the ground at the Northwest Nationals. NITROFEST! returns to Mission Raceway at this year's Canadian National Open, with the feature attraction at this year's edition being the same three groups of floppers as last year: the Nitro Nostalgia Funny Cars, the Rocky Mountain Nostalgia Funny Car Association cars and the Northwest BB/Funny Car association. Altogether, the plan is to have at least 32 funny cars in the pits and to round out the show, the track has added Nitro Harleys, Pro Street and Comp Eliminator to the mix, along with all the regular NHRA Sportsman categories. With much improved track lighting and two qualifying sessions scheduled on Saturday evening, it should even top last year's extravaganza. Despite the best efforts of mother nature to kill this event, it just seems to keep finding a way to get completed, year after year. The 2011 edition, the 9th annual, provided a different format, some great racing, and as always - expect the unexpected when it comes to the weather. The best we can say is that it didn't snow. And when the sun finally came out in force, the water trapped under the track surface appeared, causing the race to be finished at a shortened 1/8-th mile distance. Only in Edmonton. This year's edition started out in it's usual "can we actually get this done?" mode, but after the Friday morning rain passed, the clouds dissipated and the sun came out, the event proceeded under decent conditions for the rest of the weekend. With low turnouts in many classes, especially the featured Top Alcohol categories, the race struggled to achieve the vibe that made it famous in previous years, but we still witnessed some awesome personal performances and some great racing, plus a very moving tribute to a racer that couldn't attend this year's Lordco BC Nationals. Venturing into the depths of the Southwestern desert for the first time ever, we traveled to Tuscon's Southwestern International Dragway and found a little gem of a track ten miles south of the city. Tucked away in amongst sagebrush and cactus and definitely looking like rattlesnake country, the track hosted an event that went off in front of a packed house two nights in a row, and produced some very good performances on a well-prepped racing surface. While the creature comforts weren't exactly 5-star, the racing was fun, the crowds loved it and the end result was some good entertainment. Our second trip to the mecca (and birthplace) of professional drag racing, Bakersfield's Famoso Raceway, was for this year's 53rd edition of one of the most famous races in drag racing history. While it's a very different vibe than the October Hot Rod Reunion at Famoso, the competition is fierce, but the camaraderie is still alive in the "Grove" and the racing is fast and furious. We did have some camera "issues" at this race, but enough shots turned out passably well to put together a photo gallery from the four days of the March Meet. And now for something completely different, as we venture totally off the beaten path - and almost off the path itself, to spend a very relaxing week as far removed from racing and North American culture as we can possibly get. No phone, no TV, no electricity, not even an exact address, or indoor plumbing, but a priceless view and beautiful, deserted beaches that just went on forever. Throw in 80 - 85 F (30 C) temps, barely a cloud in the sky and low humidity and you've got the perfect recipe for the "getting too close to winter" blues that come thundering in at this time of year. Check it out and see what I'm raving about. Welcome to the mecca of nostalgia drag racing. The place, Auto Club Famoso Raceway, where professional drag racing really started, more than 50 years ago. Join me as I experience the California Hot Rod Reunion for the first time and capture some of the sights and stories of an event that's far more than just a drag race. It's truly a reunion of racers, fans and race cars, a car show, a swap meet, and some great drag racing with cars that you just never see at the NHRA "Big Show" events. Time to head out on the highway, looking for adventure.... hold on, this isn't tunring into some cheesy Steppenwolf rip-off, is it? Well, we'll just have to deal with whatever comes our way... damn it, stop the music, let's start over. Okay, we're off on a roadtrip to Edmonton's 9th annual IHRA Rocky Mountain Nationals, this time in the guise of a Nitro Jam, and presented by the River Cree Casino. It's always a good time at Castrol Raceway and this year will be no exception. Weather permitting, as always, of course. Join us and see what happens. Time to head out on the highway, looking for adventure.... hold on, this isn't turning into some cheesy Steppenwolf rip-off, is it? Well, we'll just have to deal with whatever comes our way... damn it, stop the music, let's start over. Okay, we're off on a roadtrip to Edmonton's 9th annual IHRA Rocky Mountain Nationals, this time in the guise of a Nitro Jam, and presented by the River Cree Casino. It's always a good time at Castrol Raceway and this year will be no exception. Weather permitting, as always, of course. Join us and see what happens. We couldn't find an actual event logo for this race, but we did find a good shot that highlights the IHRA's major sponsor, Hooters, with two of their representatives trying to back up a race car after the burnout. With both girls indicating different directions, I'm wondering if the poor guy ever found the groove. But we certainly found our groove as our first visit to the Alberta capital showed us a completely different set of competitors than can be founda at the Brand "N" races.